Comm Eye Health Vol. 31 No. 101 2018 pp S32-S34. Published online 11 July 2018. Professor: Advanced Eye Centre, PGIMER, Chandigarh, India. Visual loss from ROP will continue to increase unless improvement in neonatal care facilities includes services for the detection and treatment of ROP. This requires strong advocacy efforts, communication and collaboration among all the stakeholders. The following sections outline the issues in each of the above aspects requiring strong advocay efforts for ROP control and detection. Level I includes referral of sick newborns from Primary Health Centres (PHCs) to Neonatal Stabilisation Units (NSUs). Care in the NSUs includes stabilisation of sick newborns and care of low-birthweight (LBW) babies not requiring intensive care. Level II includes functioning of Special Newborn Care Units (SNCUs) at the district hospital level. These units are equipped with radiant warmers, phototherapy units, oxygen concentrators, pulse oxymeters and intravenous infusion pumps, to handle sick newborns with birth asphyxia, jaundice, sepsis, and LBW other than those who need ventilatory support and surgical care. The level III units are the neonatal intensive care units. improving nutrition and monitoring of weight gain. For this, adequately trained and knowledgable staff who are aware of ROP and its risk factors (nurses, neonatologists and pediatricians) are required. Intensive efforts for expanding in-service training and innovative approaches to training are needed. Improvement in neonatal care has a direct impact on reduction in the incidence of ROP. There is a lack of ROP screening programmes in the NICUS/SCNUs at many places. ROP screening programmes have remained confined to tertiary care institutions and select few hospitals in private sector without percolating down to the district level SNCUs. The National Neonatology Forum (NNF) developed evidence-based clinical practice guidelines for ROP screening and treatment in 2010,6 It was recommended that all infants weighing ≤ 1,750g at birth and/or born at < 34 weeks gestation should be screened for ROP. Infants with birth weight of 1,750-2,000g or gestation of 34-36 weeks should also be screened if they have risk factors like ventilation, prolonged oxygen therapy, hemodynamic instability or adverse respiratory or cardiac disease profile. Strong advocacy efforts recently helped incorporate ROP as one of the 30 pathological conditions to be screened for in a government run national programme. This programme [named as the Rashtriya Bal Swasthya Karyakram (RBSK)] is aimed at providing child health screening and early intervention services for children, including infants. Realising the difficulties in knowing the exact gestational age in many cases, a birth weight criterion of less than 2000g has been agreed upon to identify infants eligible for screening. The programme also entrusts the responsibility of screening up to six weeks of age with the facility providing neonatal care. The original SNCU toolkit,which guides the establishment of new SNCUs in India must specifically mention ROP screening as an essential requirement. The accreditation criteria for level II and III units should have ROP-screening facility as an essential requirement. Availability of equipment for ROP screening such as indirect ophthalmoscope, a 20 or 28 dioptre lens, infant eye speculums, infant scleral depressors in the district level hospitals and possibly retinal imaging systems such as the low cost wide field fundus cameras in the future. Time of first screening: within the first 20 to 30 days of life. Whom to screen? Wall charts need to be displayed in all NICUs on whom to screen and nurses must be trained to dilate pupils, administer drops and assist in screening. Ensure that once an “at-risk” baby is identified, it is important that the baby gets enrolled into the screening programme and completes the required follow up examinations as per protocol. Follow up: under the Home-Based Newborn Care programme (HBNC), it has been proposed that accredited social health activist (ASHA), can provide a crucial community link for identification of at-risk infants as well as ensuring that such infants complete the required follow up. Counseling parents on presence of risk factors and the expected date of next screening is essential. A simple information leaflet in local language can help in educating parents about ROP and its complications. At risk babies can be marked with color-coded wrist bands or colored stickers applied on their files/ cots for easy identification and as a reminder to the treat them. The National Programme for Control of Blindness (NPCB) along with various non-government organisations (NGOs) such as the Queen Elizabeth Diamond Jubilee Trust, Public Health Foundation of India (PHFI) have been pivotal in advocacy and communication efforts with the Government of India in formulating national guidelines and policy regarding ROP. A ‘National ROP Task Force’ has been constituted under NPCB and the Ministry of Health. It brings together leading ROP experts, who advise on the direction of the programme and provide impetus to help bring about change in policy. There is a huge lacuna as far as availability of trained ophthalmologists well-versed with indirect ophthalmoscopy and laser treatment. 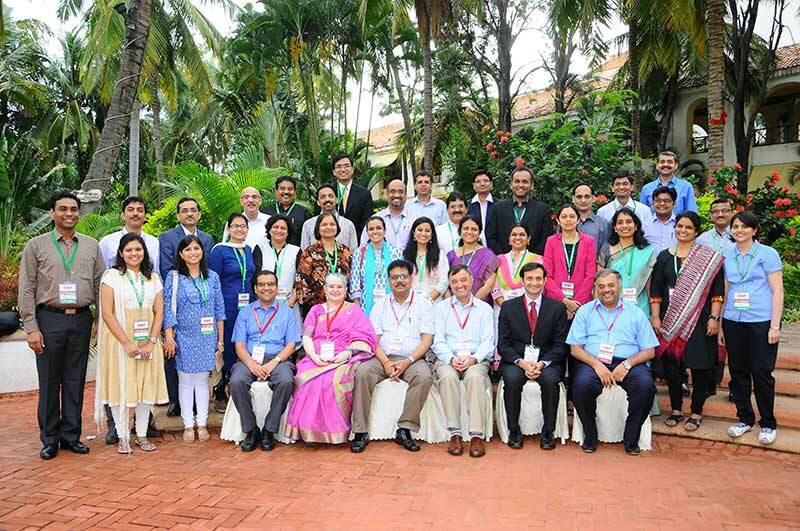 The Indian Retinopathy of Prematurity (IROP) Society7 was formed in July 2016 to bring together ophthalmologists who are involved in ROP treatment from across India (Figure 1). The current membership of this society is a mere 113 specialists, of which less than 100 are comfortable with screening and treatment. This again highlights the huge gap in the availability of trained personnel to effectively treat ROP. There are some states or regions in India with only one or two ROP trained ophthalmologists. Some ROP specialists perform only screening and refer the babies to other specialists (often in another state) for treatment. Most of the 600-odd special care units (SNCUs) in the government sector do not have access to trained ophthalmologists for ROP screening. Training comprehensive ophthalmologists in ROP screening is thus another area requiring strong advocacy efforts and innovative approaches. Medical colleges need to be equipped and strengthened to provide a mentoring role in every state. Collaboration with non-government organisations for capacity building in this area can further strengthen and widen the scope of services. Planning and prioritisation of policies should be based on data about local needs and the country’s geopolitical scenario. A system for data collection and monitoring to track the number of new borns screened and treated for ROP from various SNCUs and NICUs in medical colleges across the country is needed. The ROP epidemic can be controlled by concerted efforts of all the people involved in the management and care of preterm infants. There is a need for national policy, legislation and strong advocacy. Advocacy with the government would require strong evidence and a clear message to integrate ROP services with neonatal care. A strong committed leadership is the key for policy change. 1 Lee ACC, Katz J, Blencowe H, Cousens S, Kozuki N, Vogel JP et al. National and regional estimates of term and preterm babies born small for gestational age in 138 low-income and middle-income countries in 2010. Lancet Glob Health 2013; 1: e26–e36. 2 Gilbert C, Rahi J,Eckstein M, O’Sullivan J,Foster A. Retinopathy of prematurity in middle-income countries. Lancet 1997; 350: 12-14. 3 Blencowe H, Moxon S, Gilbert C.Update on Blindness Due to Retinopathy of Prematurity Globally and in India. Indian Pediatr 2016;53 Suppl 2:S89-S92. 4 Vinekar A,Jayadev C,Kumar S,Mangalesh S, Dogra MR,Bauer NJ,etal. Impact of improved neonatal care on the profile of retinopathy of prematurity in rural neonatal centers in India over a 4-year period. Eye Brain 2016; 20;8:45-53. 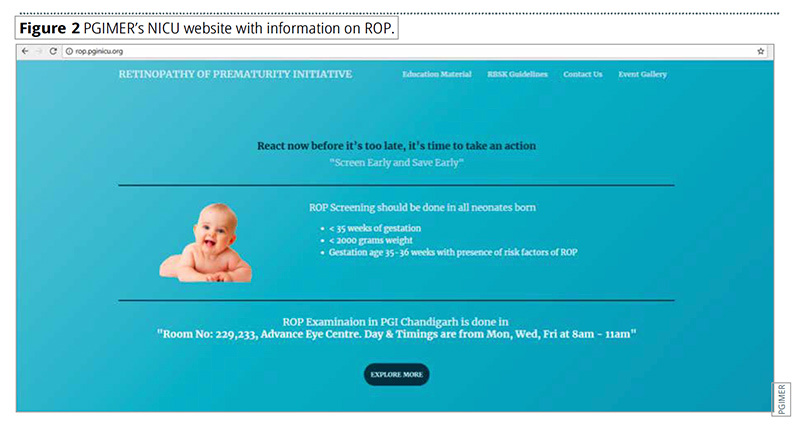 5 Sanghi G, Dogra MR, Katoch D, Gupta A.Demographic profile of infants with stage 5 retinopathy of prematurity in North India: implications for screening. Ophthalmic Epidemiol 2011; 18:72-4. 6 Pejaver RK, Bilagi AP,Vinekar A. National Neonatology Foundation’s Evidence Based Clinical Practice Guidelines 2010. Retinopathy of Prematurity (NNF India, Guidelines) 2010; 253-262. 7 Vinekar A, Azad R, Dogra MR, Narendran V, Jalali S, Bende P. The Indian retinopathy of prematurity society: a baby step towards tackling the retinopathy of prematurity epidemic in India. Ann Eye Sci 2017;2:27.